Ceramic/porcelain tile and vinyl tile are different, always will be. And while they will never be confused for each other, the gap between the two is getting narrower all the time. How do you pit differing materials against each other? Answer: context. In most rooms of the house, vinyl and laminate flooring are close contenders. But in the context of the bathroom, laminate falls to the wayside and tile steps in. For one, vinyl and tile share qualities (such as superb water-resistance) that other coverings such as wood and laminate sorely lack. Within the bathroom are competing motives again, all hinging upon context. Want a bathroom floor completed in two days for house guests? Then vinyl tile is the clear answer. Ceramic tile grout would still be drying by the end of day two and awaiting a dehazing. Looking to max out your resale value because you intend to sell within a year or two? Then install quality ceramic tile, not vinyl tile. Best: Vinyl tile and plank are easier to install than ceramic or porcelain tile. Installation is the linchpin that controls cost and time-frame. Ceramic and porcelain tile cannot be dry-installed. It always requires mortar and grout. No one has yet invented a self-stick mortar-less mat for flooring like Bondera did for vertical tile. Tile cutting can be difficult for do-it-yourselfers, as the cleanest cuts are produced with wet tile saws, not cheap snap cutters. Vinyl plank is nearly always dry-installed. One exception is with some types of luxury vinyl tiles that look like stone such as Armstrong Alterna which allow for grouting as an option for a more realistic look. Vinyl is easily cut by scoring it with a utility knife and snapping it off. With no bed of mortar to lay, your vinyl tile lays lower than tile. This is especially important in basements and other areas that may have a low ceiling where every vertical inch counts. Best: Ceramic tile, overall, tends to look better than vinyl tile. Of course, you can find the ugly ceramic tile. Bad tile abounds. Pitting the worst ceramic tile against the highest-quality luxury vinyl tile is no contest: vinyl wins out. But in an apples-to-apples comparison, taking one of the best-quality plank brands (i.e., Shaw 5th & Main) vs. the best ceramic/porcelain tile, tile comes out ahead. Mainly, this is because of the limited number of quality vinyl tile brands, whereas there is no shortage of premium porcelain brands -- not just from established tile companies but from myriad artisan tile makers around the world. Simply put, high-end tile can often be the unique vision of an artist. High-end vinyl is still a corporate product that reflects largely average aesthetics. Best: Vinyl tile is lighter than ceramic tile in terms of transporting materials. A case of ceramic tile that covers 15 square feet will weigh about 45 pounds. By sharp contrast, vinyl tile covering the same area will weigh about one-third, or about 13 pounds. Both products lend themselves to easy transport in cars or SUVs, pickups not required. On a square-foot by square-foot basis, tile is far heavier than plank vinyl, especially when you add in the additional required layers of thinset, cement board, and grout. Best: Vinyl tile is faster to install than tile and you will be able to use it sooner than if you had installed ceramic. In a 120 sq. ft. bathroom installation, you can lay down an entire vinyl plank floor in about 3 hours, not including toilet removal and re-installation. With ceramic tile, by the end of the 3rd hour, you would have finished screwing down the cement boards. If cement board is not needed, you would likely have finished laying down a few rows in the thinset. Remaining: the rest of the rows, plus a day or two to let everything solidify before grouting. Removing obstacles to starting the installation is important, too, and with that, vinyl is superior. Unlike ceramic tile, vinyl tile requires no mixing, no water, no bucket clean-up, no cutting with a wet tile saw, no tile spacers. It's an easy in, easy out process. As soon as the tile is down, you can begin walking on it. By contrast, ceramic and porcelain tile should cure for at least a day before use. Best: Both vinyl and ceramic tiles are comparable in terms of resistance to water. The face of a vinyl plank is 100% impervious to water. The face of porcelain tile is defined as impervious, though strictly speaking, it is not, as it has a water absorption rate of < 0.5% as defined by American Society for Testing and Materials (ASTM) C373. This means that, under rigorous test conditions, porcelain tile will absorb a trace amount of water. Consider that tile is used for heavy water conditions, like pools and showers, and you'll understand why < 0.5% isn't anything to worry about with flooring tile. Seams are more the issue. With both, if seaming is done right, water will not infiltrate. But which flooring provides better conditions for the DIYer to get the seams right? Plank seams can be tricky, and if you leave a gap, that gap is always there. With tile, all seams are filled with grout and are sealed. While you can poorly grout and seal a tile floor, it's always possible to go back and fix it. A gapped plank vinyl floor cannot be un-gapped except by re-installing the entire floor. The world of tile is too vast to draw a valid comparison with vinyl tile. For example, at BuildDirect the cheapest 8 mm ceramic tile is about $0.70 per square foot. The cheapest self-stick 2 mm* vinyl plank is $1.09 sq. ft. But do you really want rock-bottom? To get a decent vinyl tile worthy of your bathroom, you'll want to step up the thickness to 5mm, which doubles the price to the low $2 range. Increasing the tile cost to $2 sq. ft. brings you slightly thicker tile (8.7 mm), but more importantly, gives the tile greater visual appeal and fewer repeated patterns. 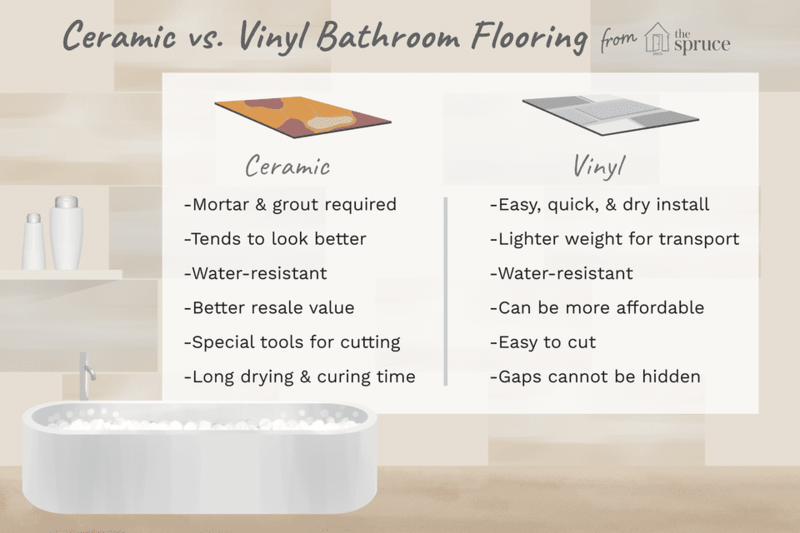 Best: Ceramic and porcelain tile tend to improve your home's resale value over vinyl tile. Call it prejudice or call it sound reasoning, but home buyers still tend to value an expertly installed quality tile floor over plank vinyl. Tile imparts a greater feeling of permanence and solidity than vinyl. Consider this: a roomful of floating vinyl plank can be taken up in minutes by hand; tile requires hours of laborious chipping. Plank's ease of removal means that you can change it out at a whim, as long as you're willing to spend the money. Tile is a decision you dwell long and hard on and then make the irreversible leap. A house with high-quality tile used as bathroom flooring will be one factor that contributes to a home's greater resale value. Tile: This refers to either ceramic or porcelain tile, a clay product fired in ovens until it is rock-hard. Tile often will mimic the look of stone, but a recent innovation is a tile that looks surprisingly like wood. Vinyl Plank: Vinyl (resilient) has long been available in squares or large sheets, but recently plank vinyl flooring has been making its way into homes. Usually taking on the look of wood or stone, the vinyl plank is long and narrow--48" x 6" is one popular size. * = Ceramic/porcelain tile will always be thicker than comparable vinyl planks; it's just the nature of the material.